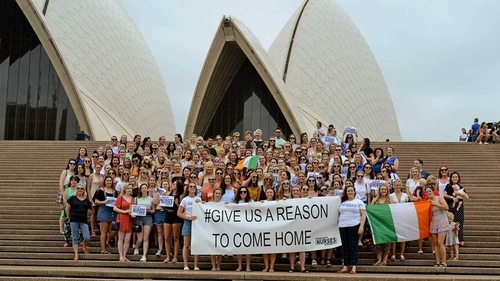 More than 250 Irish nurses staged a demonstration at the Sydney Opera House yesterday in support of their striking colleagues. The demonstration follows the announcement earlier this month that nurses belonging to the Irish Nurses and Midwives Organisation are to hold a number of 24-hour strikes in an escalation of their pay dispute. The first strike is to take place on 30 January, with further one-day strikes planned for 5 and 7 February, and then on the 12, 13 and 14 February. Talks between the INMO and the Public Service Stability Agreement Oversight Body on Friday concluded without a breakthrough. Speaking at the demonstration in Sydney, Irish nurse Laura Phillips said the pay in Ireland is "not competitive" and hundreds of Irish-trained nurses working in Australia will not come home until salaries improve. Minister for Finance Paschal Donohoe has ruled out a 12% pay increase for nurses, claiming it could trigger a spate of public service strikes by other public workers looking for a wage hike. He said: "That route will spell massive difficulty for the ability of this wage agreement to stay in place."